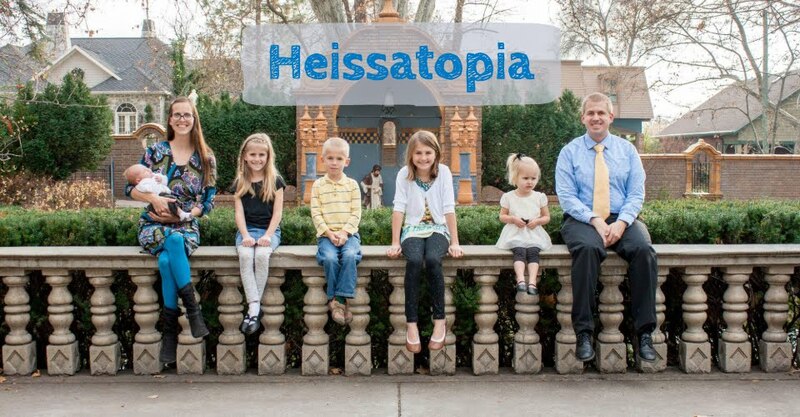 Heissatopia: I'm not [giving] away my [baby]! Today was a bit crazy. I had gamelan in the afternoon and then Andrew and I had to go his department's post-Christmas party and then we had to pick up some groceries for Miriam's (very timely) post-birthday party (nothing like having your party three months after your birthday, amirite?). Andrew and I didn't even see the girls after school. Rachel had play practice and Miriam went to a friend's house. We left Benjamin and Zoë with Grandma and Grandpa (thanks for sitting!) and spent the night on the town (with Alexander in tow). When we came home—at 8:59—the kids were all still up. Grandma was really glad we came back because 9:00 was her cutoff for bedtime (she'd told herself that if we weren't home by 9:00 she was just going to have to tuck all the kids in herself, which she really didn't want to do because, frankly, bedtime is a lot of work). So when we walked in the door she offered to take the baby while we got to work putting the bigger kids to bed (all except Miriam who wasn't even home from her friend's house yet (she'd stayed for dinner and a movie)). We went upstairs and found Zoë on the couch, watching a show with Grandpa. Rachel was in her room watching some Doctor Who on her Kindle, and Benjamin was in his bedroom wrestling with his footie jammies (those suckers are difficult to put on, apparently). Zoë only had a minute and a half left of her show, so Andrew said she could finish it, but she didn't want to. She wanted Mommy to hold her, so we turned off the show and headed to the bathroom to find her toothbrush. "Where's the baby?" Grandpa asked jokingly. "Did you lose him or something?" "Naw," I answered. "We gave him away." Grandpa chuckled and started down the stairs and I had just started brushed Zoë's teeth when Benjamin stumbled into the bathroom ugly-crying. "Why'd you give Alexander away?!" he sobbed, clinging to my leg. "Oh, I didn't give him away!" I said, stroking his head (I hadn't even realized he'd overheard me say that). "I was only joking with Grandpa. Grandma's got him. Don't worry!" "I don't want you to give Alexander away!" he said, still sobbing. "I love him! And he's my brother!" Zoë was getting upset about the way Benjamin was clinging to me (because she was trying to cling to me) so I called Andrew in to comfort him. He told him the very same thing: "Grandma's holding him. It's alright." I sneaked down the stairs with Zoë to tell Grandma this (because it was so cute and funny) and to retrieve the baby as evidence, but she passed me in the hallway, sans baby. "Grandpa told me to go upstairs to tell Benjamin I don't have the baby," she said impishly. "He's already upset..." I said. "I know," she whispered, sneaking up the stairs. When Benjamin saw her he wailed, "Where's the baby!??!?" "I don't have him," Grandma said, shrugging her shoulders dramatically. And just when that poor (slightly overtired) child was about to collapse in a heap of tears all over again, he heard the faint honk-honking of his precious baby brother (who was being carried up the stairs, safely stowed away in Grandpa's arms). It was more than a little mean (but just think, Benjamin—now you know how much you love your brother). When everyone had calmed down, Andrew asked Benjamin to say family prayer. Evidently Benjamin had only calmed down outwardly; his insides were still full of turmoil. The body of his prayer was, in entirety: "We're thankful that Mom didn't give Alexander away, and please bless that she will never ever give Alexander away!" We had to have a very reassuring chat together while I was tucking him in. Later, when Miriam came home and we'd ushered her off to bed, Andrew caught her setting her alarm clock for her regular school day time. "You don't need to set an alarm," he said. "Tomorrow is Saturday. You can sleep in." She was evidently also slightly overtired because she dissolved into tears and started blubbering about needing to wake up early so she can clean the whole house before her party. "That's a nice thought," Andrew said. "But what you'll probably do is sleep right through your alarm (since that's what you do most school mornings). So how about you just don't set an alarm? We'll have plenty of time to clean the house before your party without setting an alarm." I'm pretty sure she cried herself to sleep (at any rate she seemed to be fast asleep by the time I made it upstairs to check on her (and lucky for her, Grandma and Grandpa had the other kids clean up the basement already, so there isn't too much cleaning left to do)) but hopefully tomorrow will be a good enough day that it'll make up for it. She's been looking forward to this party for literal months. Anyone else got a house full of sleep talkers? Just me? It's probably because they're all scarred emotionally from stunts like what we just pulled on Benjamin (but it was just too easy—he practically walked into that one).